HomePoliticsThe Note: Can Democrats beat Trump’s GOP with Obamacare? The Note: Can Democrats beat Trump’s GOP with Obamacare? August 21, 2018 Paul Politics Comments Off on The Note: Can Democrats beat Trump’s GOP with Obamacare? Obamacare once sparked a political backlash that cost Democrats control of a chamber of Congress. Eight years later, it just might be what gives them a fighting chance at taking another chamber back. The political potency of health care will be on fresh display in West Virginia on Tuesday. 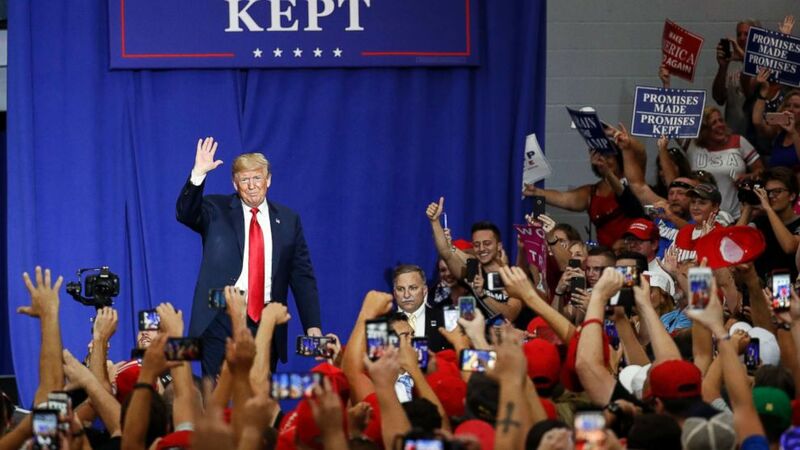 President Donald Trump is making his sixth visit to the state as president, as he seeks to oust an incumbent Democrat who wants his campaign to be about saving Obamacare. Sen. Joe Manchin is attacking his GOP opponent, Attorney General Patrick Morrisey, for his attempt to get Obamacare’s pre-existing conditions guarantee ruled unconstitutional. Manchin says 800,000 West Virginians could lose health care if the Trump administration effort – joined by 20 state attorneys general – succeeds. Sen. Joe Manchin looks on during a news conference to discuss the national opioid crisis, on Capitol Hill, June 27, 2017, in Washington, DC. Tellingly, Manchin’s arguments are being echoed by Democrats in tough re-election fights in states including Missouri, North Dakota, and West Virginia. Trump has said the fight over Obamacare continues – and the men and women he’s trying to defeat are welcoming that. Democratic women are poised to make history again on Tuesday. The frontrunner in Wyoming’s Democratic gubernatorial primary, Mary Throne, could be the tenth Democratic woman nominated in a governor’s race this year. That number would set a record for the two major political parties. Throne, a former state representative and minority leader, is facing two other Democrats in the primary. She says she is running to protect public education, invest in infrastructure and stabilize the local government budget and spending. Of course, Wyoming is a deep-red Republican stronghold. Should Throne win her primary Tuesday night, she will likely be considered the underdog almost instantly in the general election. The GOP primary field is jam-packed with five men and another woman, a lawyer and state rights advocate, Harriet Hageman. Nationwide, Republicans have nominated four women in governors’ races this year, compared to nine for Democrats. Both parties have more women on gubernatorial primary ballots still to come. While the president’s call to cancel the military parade he wanted was abrupt, the details of how he decided have been slow to surface. Pentagon spokesperson Col. Rob Manning acknowledged Monday that nobody at the Pentagon had informed Trump of the latest estimates for the November 10 event beforehand — or of the range of options prepared. “The president was not briefed by any member of the Department of Defense on any cost associated with the parade,” Manning told Pentagon reporters, before referring questions to the White House, which didn’t respond to an ABC News request for comment. Defense Secretary James Mattis introduces Vice President Mike Pence before he announces the Trump Administration’s plan to create the U.S. Space Force by 2020 at the Pentagon, Aug. 9, 2018, in Arlington, Virginia. So, the president apparently canceled the parade he ordered either after seeing news reports about a new $92 million estimate, or after a member of his staff told him about new cost figures but didn’t inform or check with the DoD. Jurors in the Paul Manafort trial begin their fourth day of deliberations at 9:30 a.m. The president meets with Secretary of State Mike Pompeo and U.S. Ambassador to the U.N. Nikki Haley before traveling to West Virginia for a campaign rally Tuesday night. The president’s Supreme Court nominee, Brett Kavanaugh, is expected to meet with at least five Democratic senators as well as moderate Republican Sen. Susan Collins of Maine. Sen. Elizabeth Warren delivers a speech on ending corruption in Washington at the National Press Club at 10 a.m.
ABC News will provide updated results of the Alaska and Wyoming primary elections throughout the evening. “Let’s face it, most children are more aware of the benefits and pitfalls of social media than some adults.” – First lady Melania Trump at a cyberbullying summit outside Washington, D.C., Monday.